I have been thinking about Las Vegas. This year’s National Council of Teachers of English convention will take place there in November. However, what prompted thoughts of Vegas wasn’t the convention or the slots, but a recent article on broadway world.com about that noted the Las Vegas Shakespeare Company’s announcement that it would be undertaking a capital campaign to fund the renovation of the historic Reed Whipple Cultural Center. What fascinated me was the fact that the theater company won a unanimous vote from the Las Vegas City Council last September to lease the building. According to the article, the Las Vegas Shakespeare Company (LVSC) has been “producing and performing world-class theatre plays and musicals since 2008 … [and] by early 2014, LVSC will continue bringing the Bard to high school students across Clark County through its Shakespeare in the Schools program and staging the beloved Shakespeare-In-The-Park and spring children’s musical for the City of Henderson.” The mission of the LVSC is to “create a vibrant professional resident theater and cultural arts institution to help promote a better quality of life for all residents of Nevada.” It sounds like Las Vegas has much more to offer than gambling. It also sounds like the city council understands the importance of the arts — and Shakespeare — to its community. Are there any other city councils helping to pave the way for arts development in their communities? If you’re headed to Vegas for the NCTE convention this November, it might be a good idea to check out what the Las Vegas Shakespeare Company has in production when you’re there. And, if you are attending the convention, be sure to visit us in the exhibition hall, and plan to attend one of our sessions. Another time, another place, another Brutus! 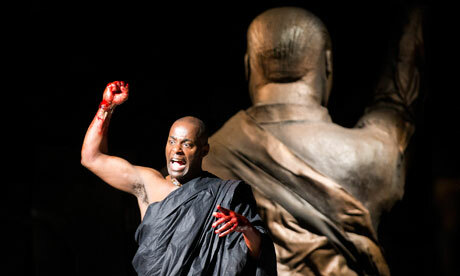 Twenty minutes into watching the recent RSC all black production of Julius Caesar, my overall sense was, “Why hasn’t this been done before?”. The play makes a seamless transition from Ancient Rome to modern day Africa, a continent which has seen numerous violent uprisings and civil crises in the last few decades. Echoes of Uganda, Rwanda, Zaire are brought to mind as the play explores the temporary nature of government and the fickleness of the mob. The undertones of the corruption are reinforced by the large gold watches worn by some of the lead characters. This production revitalizes some of the themes in Julius Caesar which have perhaps been lost through the traditional setting of the play in ancient Rome. This is achieved by adding sinister layers of ambiguity to the main protagonists as they debate and argue over the nature of leadership. The drums and rhythms of Africa provide a vibrant energy to the play, especially at the beginning as we are introduced to the characters and the political scene is set. The all black, predominantly male, cast wear African robes which effortlessly replace Roman togas and a witch-doctor provides the foreboding words about the Ides of March, again a perfect transition from the Roman soothsayer. The back of the stage is dominated by a huge statue with his back to us-all we see is his torso and right arm raised in a defiant upward thrust. After Caesar’s assassination, the statue is toppled and it leaves a gaping ashen void for the rest of the play. Setting the play in Africa struck me as an inspired choice not only because of the contemporary echoes that resonate but also because I felt that anyone coming to see the play for the first time, with no knowledge of the “original”, would be totally engaged and be likely to believe that this play was written for this setting. Shakespeare’s plays live on precisely because they can be transposed to a different time and location. The truth in them and the richness of the language ensure their longevity. However I was just blown away by how this particular transition seemed to work so well. Has anyone else experienced this at a particular production? Love to hear! Q: Have you ever messed up in front of a live audience? A: I was hoping you wouldn’t notice! Ah, but it does happen all the time, you’ll trip up, or miss a beat or mix up your words… but that’s the beauty of live theatre! You never know what can happen! Q: When did you decide that Hamlet goes crazy in the play? A: I looked to the text – it gives me little clues here and there about my actions and about my mindset. In the soliloquies, sometimes, I get to say exactly what I’m thinking or feeling, and the rhythms and words tell me where to go. Q: Does the show change with each theatre you travel to? A: Every new venue is a new show. We’ve performed this play together over 80 times now, but none of us are bored with it. When we were in England on the tour, it was all outdoors and we were competing with the elements to be heard and seen and to just get through the show – we’re used to that at the Globe! Here at the Folger, this is our first indoor venue, so our first night here we were still very <ROAAAR> and LOUD and I think that first night we really blew the audience away… literally. They looked like they’d been run over by a freight train by the end! Dominic [our director] told us afterwards to just bring it down. Q: Why did you decide to use only eight actors when there are so many parts? A: Being on tour means it’s easier for fewer people to do the traveling, and it happens a lot in Shakespeare that some actors will double or triple (or further multiply) the number of roles they have. Not every character is onstage all the time, and while it was sometimes challenging for us, we have a great time running around swapping from gravedigger to priest to courtier to player and moving the show forward. Q: What was it like to put comic elements in a tragic play? A: Well that’s really interesting because we didn’t. Shakespeare did. You know, there’s sometimes this whole pre-conception that the tragedies have to be very dark and tragic the whole time, but the reality is Shakespeare knew that it was only the end of the play that made it either tragic or comic. The rest was just human behavior. It also helps the tragedy land with you emotionally if you get the contrast with a lot of levity before everything bad happens. 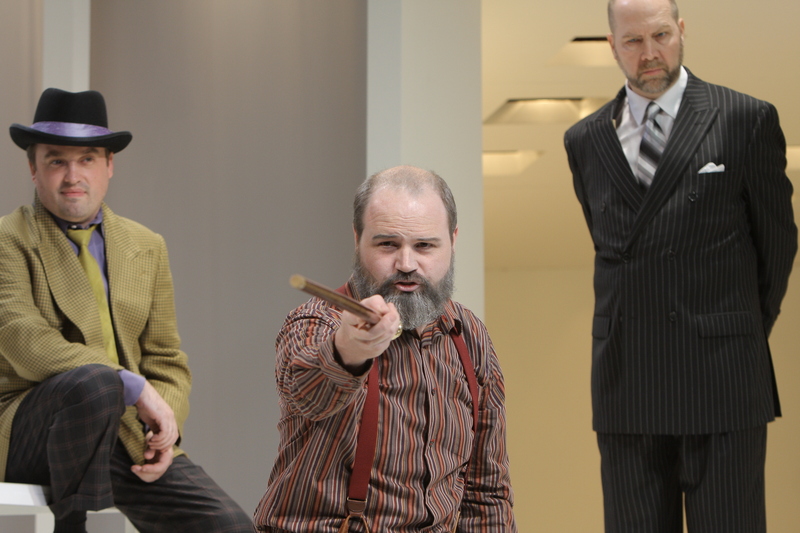 Yes, we have a very light-hearted production, but the comedy is in the text. Thanks so much to the actors: Michael Benz, Peter Bray, Miranda Foster, Tom Lawrence, Carlyss Peer, Matthew Romain, Christopher Saul, Dickon Tyrrell; and to Charlotte Hall and the stage management team for making arrangements for us. It was as if I had written the script! When I asked how many of them had trouble understanding Shakespeare’s language, lots of hands went up. So we had a great opportunity to chat about Shakespeare’s language, how similar it really is, and how they can get at some of the words they don’t (yet) understand. To help them access the language, I had them do what Shakespeare intended all along: gave them lines from the plays to act out. 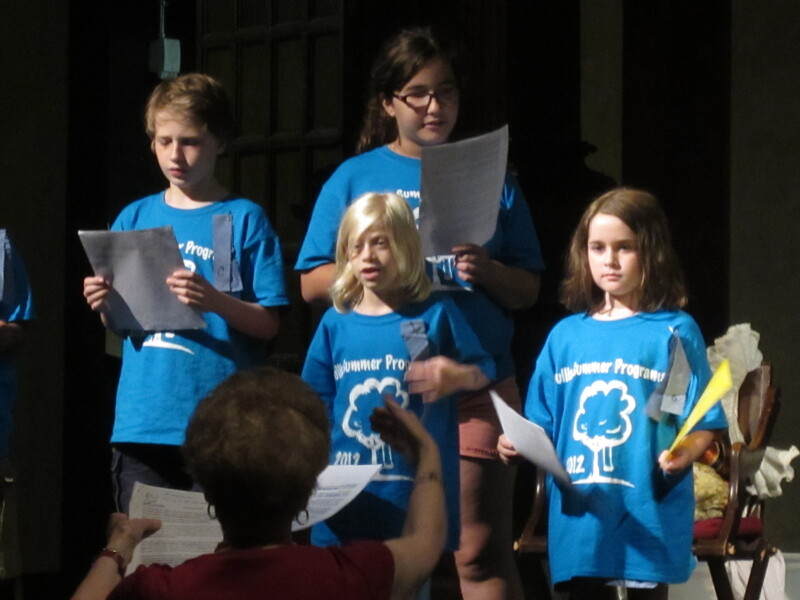 We started with insults from the plays—perfect for eighth graders. I encouraged them to use their bodies (we quickly established a “no touching” rule) to reinforce what they were saying. Within moments, the students were practicing hurling insults at each other. Then in groups they insulted other groups and, eventually, the whole class. After this activity, I had them look at their scripts. When I asked if there were any words they didn’t know, they said there were. I had them tell me how they figured out what they were saying and how they should act out the words. They had several good suggestions: look at the surrounding words, look for parts of words they did recognize, or sound the word out. It turns out that although several students didn’t recognize words in their scripts, not one student let that get in the way of enthusiastic participation. In other words, by acting out the language, they understood it. I reminded the students what that Shakespeare is meant to be an experienced, that the words are alive and intended to be spoken and acted. By giving them an opportunity to do so, they were able to make sense of the words by turning them into action. It was wonderful to see them own these lines and recognize their own ability to understand language they had thought was too difficult. Carol Ann Lloyd Stanger is the Docent Liason for Folger Education, a frequent contributor for Making a Scene, and a published writer for Calliopemagazine. 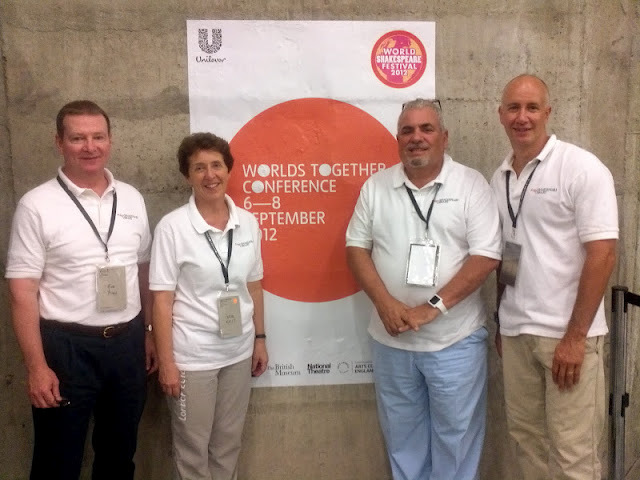 Bob Young, Carol Kelly, me, and Chris Shamburg at Worlds Together Conference. Team Folger just returned from the Worlds Together Conference, part of the World Shakespeare Festival in London. Worlds Together was a collaboration between Tate Modern, Royal Shakespeare Company, the National Theatre and British Museum. This international conference brought together artists and educators to explore the place of Shakespeare and the arts in young people’s learning today. Held at the Tate Modern Museum on Bankside, it hosted over 100 speakers and contributors from 23 countries across three days. The Folger Team led our workshop on Day 2 with an emphasis on language and performance. In addition, Chris Shamburg showed some wonderful techniques to make Shakespeare’s words come alive with technology. Another partner in the Conference was the British Museum where we saw their exhibit, Shakespeare Staging the World. That exhibit is well-worth attending and it runs until November 25. 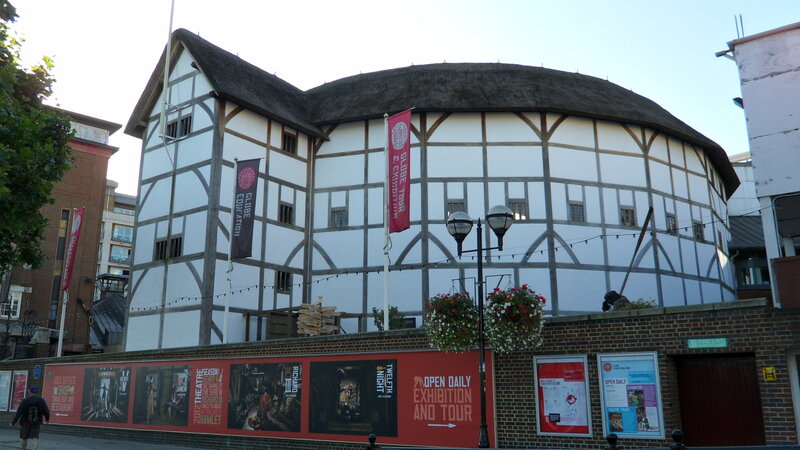 In our off time, we attended a performance of The Taming of the Shrew at Shakespeare’s Globe. 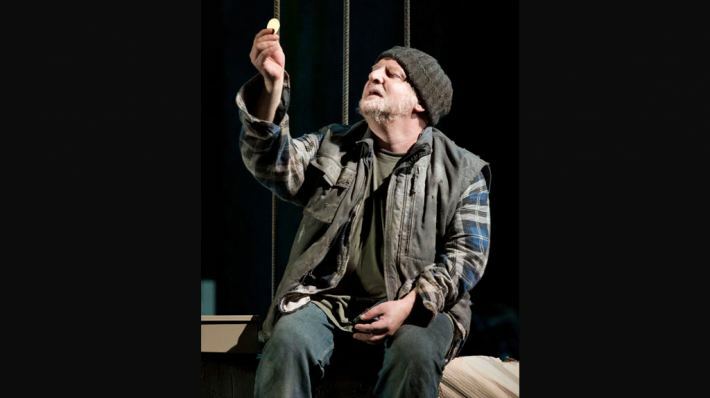 Bob Young and I also saw a fabulous production of Timon of Athens at the National Theater starring Simon Russell Beale. Next stop for Team Folger: The NCTE Conference in Las Vegas. We hope to see you there. Not read silently to oneself. And not simply read aloud in a round robin in class. Part of the experience is watching how characters interact, and how the words can be used to inform action. Getting students on their feet with the language, looking for action clues in the text to inform their movements, helps them to understand that performing Shakespeare isn’t how it looks on TV: planting your feet and declaring your lines – it’s full of the action and excitement we still get in modern entertainment! A great way to show this to your students is to take them to a performance. Seeing actors performing Shakespeare’s plays brings it home that these are vital and humanly connected pieces of theatre – not just old words on a page. While you’re planning your field trips for the year, consider your local theatre companies: do they perform Shakespeare? Do they have student matinees, or evening performances your students could get to on their own? Will you be teaching the play they’re performing, or can you relate it to the one you are teaching? Shakespeare’s plays are public domain – which means anyone, anywhere can perform one of his plays for free – so across the world thousands of companies from amateur to professional will be performing Shakespeare at any given time! It’s worth looking at this list of Shakespeare Festivals and Theatres compiled by the Shakespeare Fellowship, but just as worthy is looking at your local culture scene. 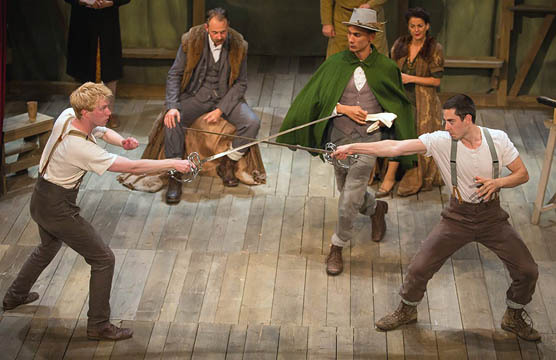 Community theatre, college theatre, high schools, professionals, touring houses… If anyone is putting on a Shakespeare play, consider taking your students to see it and discussing the performance with them as part of your Shakespeare unit. What about the performance worked? If it was modernized – how did the text support their changes – or did it not work? What connections did your students feel with the characters, and was that any different from how they felt when reading it themselves? 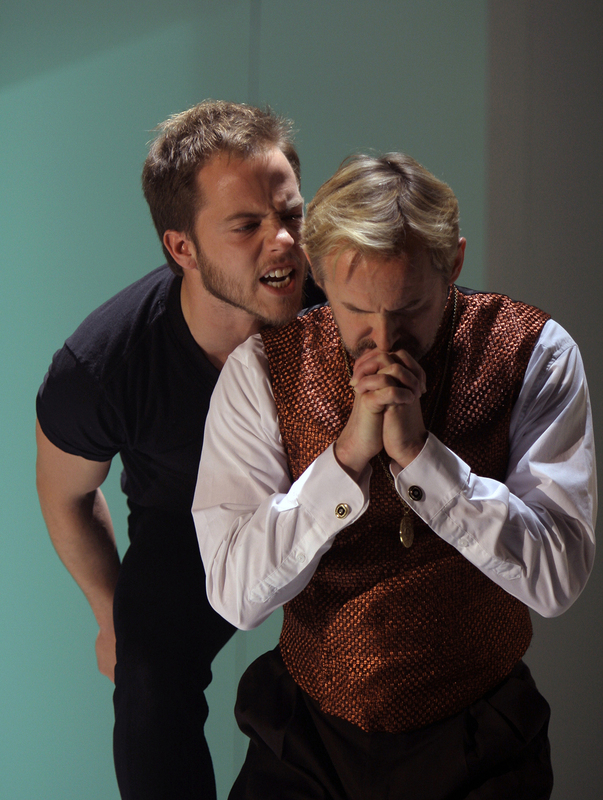 Seeing Shakespeare in performance opens up an entirely new discussion field for your class. What sort of performances are available in your area? Do you take your students to see performances? Let us know in the comments!